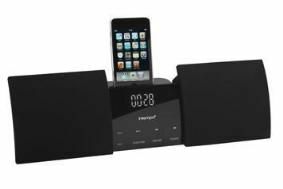 Intempo delivers compact iPod dock with an 'arena-sized sound' | What Hi-Fi? Mains-powered, it also has a built-in FM tuner, a five-preset equaliser, and an alarm allowing you to wake to the radio, iPod or buzzer. Complete with a remote control, the Intempo Arena is on sale now at HMV, Amazon, Comet, Sainsburys and ASDA.